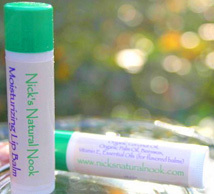 Our lip balm are made by us, through our sister company Nick's Natural Nook! We look for high quality ingredients in personal products we use and wouldn’t think of offering anything less in products we offer you. The ingredients in our lip balms are simple and of the highest quality. There are NO unnatural additives and NO harmful petroleum / vaseline. Our balms are also very moisturizing. Ingredients: Organic Coconut Oil, Organic Palm Oil, Beeswax, Vitamin E oil, Essential Oils (in flavored balms).